We had a great weekend ant the Super Mush! 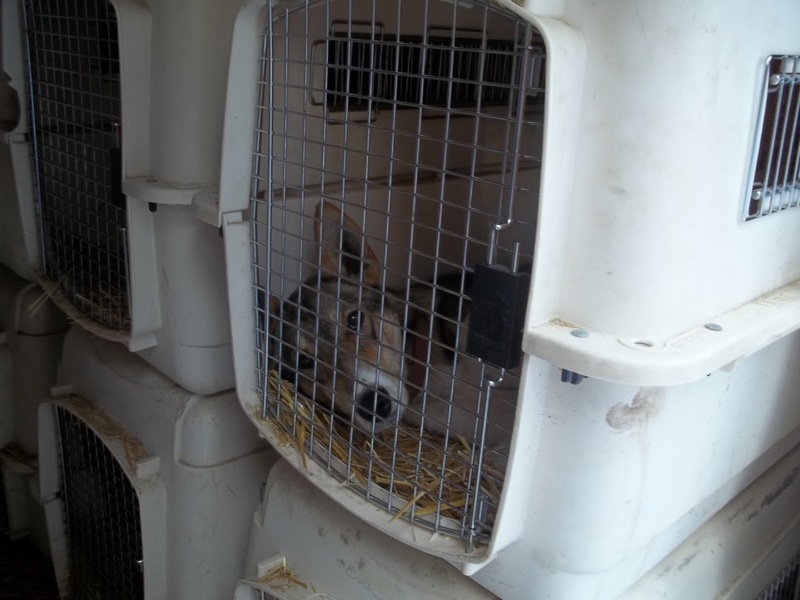 I ran 11 dogs in the race which was 35 miles on both Saturday and Sunday. We ended up placing 2nd, but we were less that 2 minutes behind the first place team! All the dogs did great, I ran Bella, Otter, Alice, Neffertiti, Khufu, Super Cub, Tut, Cessena, Jasper, Kaycee, and Ra. Currently, we are in Wenatchee, recovering for a couple days before the Cascade Quest this upcoming weekend. Day 1, my time was 2 hours, 41 minutes, and 25 seconds. Day 2, my time was 2 hours, 36 minutes, and 51 seconds, for a total of 5 hours, 18 minutes, and 16 seconds for 70 miles. 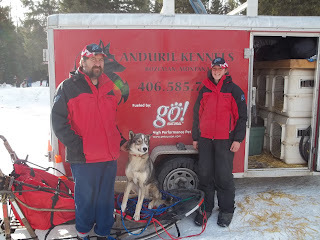 My dad, Emmett, and I by our trailer with our Go! gear on. 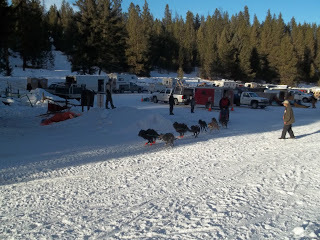 Last weekend, we went to the Darby Dog Derby in Darby, MT. Both my dad and I ran in the 8-dog 24mi/day class. The first day both of our teams did well, and the second day the course was shortened to 14mi rather than 24mi because it was pouring down rain. Jasper led for the first time in a race on dad's team and did really well! In the end, I received 3rd place, and my dad received 4th. We had a great time and got to visit with friends. However, everything is soaking wet now and all the equipment and clothing is in the house attempting to dry out. 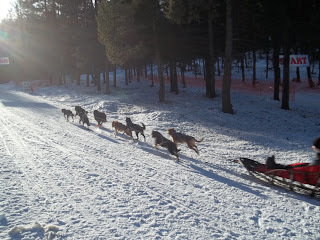 This upcoming Thursday, we will be leaving for Washington for the Conconully Snow Dog Super Mush on the 22 and 23, and will stay there and train till the Cascade Quest the following weekend that is also in WA. Both are 12-dog races that I will be competing in. Last weekend, we went to the F.S.D.D. race in Olney/Whitefish, MT. The race was two days of 25 mile heats. All the dogs did very well! The first day, my team broke trail for all the other teams through a snowy section of the trail and ended up in 10th place that day with a time of 2hrs and 19min. Dad's team was in 6th place that day and had a time of 2hrs and 12min. But, on the second day, me and my team made a huge comeback, improving our time by 30 minutes and placing 6th place overall with a second days time of 1hr and 50min. Dad ended up in 7th place overall, with a second day time of 2hrs and 4min. 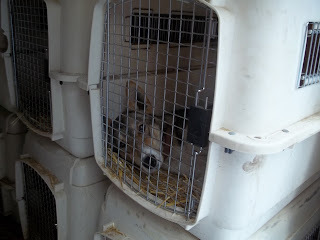 We also camped out at the race and slept in the trailer with the dogs, it was very cozy. I also recieved the Sportsmanship Award for breaking trail for everybody the first day! Last year at this race, I recieved 10th place, so we made a huge improvement this year! Today, I went alpine skiing with my cousins and my aunt at Bridger Bowl. We had a great day of skiing! I really like skiing because it is basically the same as driving a dog sled, except that the skis are not attached to each other. After a full day of skiing, most of my cousins were pretty wiped out and my aunt asked me if this was a harder work out than a day on the dog sled. I said no, today's all day skiing trip was way more easy than a day training the team. It is much harder to steer a big dog sled than steer lightweight skis :) We have another ski trip planned for February 8th, and I'll be looking forward to that. We brought in the New Year at a sled dog race in Pinedale, WY. The race was 28 miles on both Saturday and Sunday. 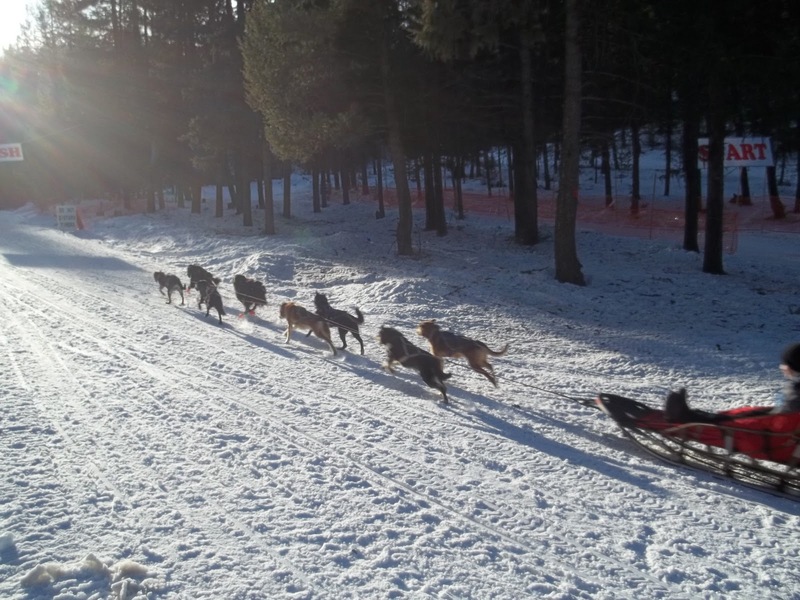 I ran a 10 dog team in the race and trained the other 6 dogs afterwards on Saturday. My dad was the Race Marshall. The first day was in the negative 20s, and it was really windy. We did the run in about 2 hours the first day, and about 2 hours and 12 minutes the second day in -15 degree and windy weather. The trail the second day was a little slower and soft because the groomer went out on it about an hour before the race start. The dogs did really well. It was purely a training run for us since the race is more of a sprint race, but we did get 10th place out of 13! The first day, I had my experienced leader, Otter, in lead with her 18mth old daughter, Bella, and the second day, I put Bella and Alice (the 2 sisters) in lead together, and they did great. Khufu, Super Cub, Neffertiti, Cessena, Tut, Jasper, and Kaycee all ran in the team with Bella, Alice, and Otter. We have another race this weekend in Flathead, MT area. In this race, both dad and I will run in the 8 dog class.